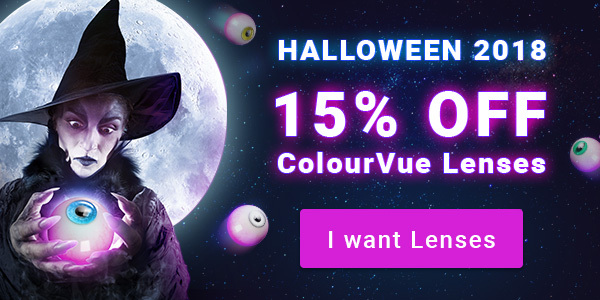 Halloween special: 15 % discount on coloured crazy lenses! Until 31 October only! Do you know coloured crazy lenses? – the perfect addition to a perfect party, including Halloween! Be the centre of attention everywhere you go with the ColorVUE Lens and FUN lenses that you can now get with a 15% discount. Do you want to resemble a zombie, or would you prefer a devilish red look? We’ve got both – and other forty motifs to choose from. First choice lenses for special occasions such as New Year’s Eve or Halloween. Excellent covering qualities. They look just like in the e-shop. Easy to apply even for those who don’t normally wear contact lenses. Simply perfect, I couldn’t find any other like them anywhere else. The special offer ends on 31 October and you will activate the 15 % discount by clicking the banner. Each customer can only use the discount once and it can’t be combined with any other special offers.